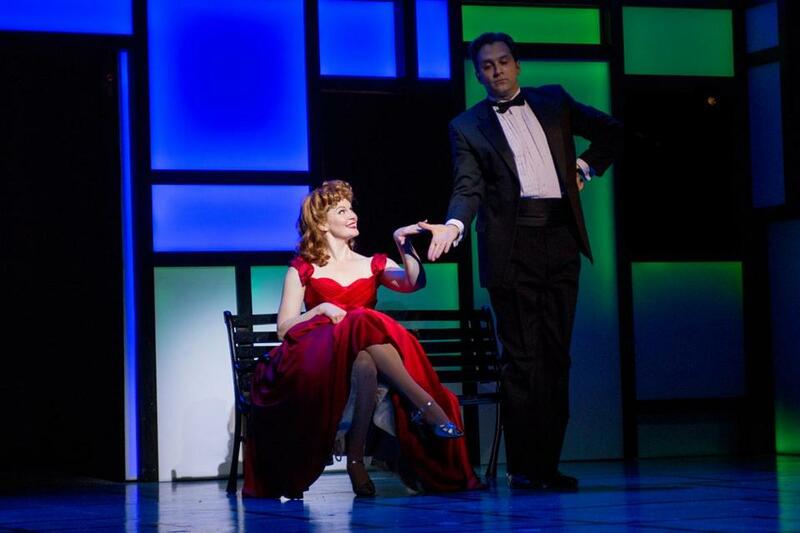 Kate Baldwin and Graham Rowat in Berkshire Theatre Group’s “Bells Are Ringing,” directed by Ethan Heard. PITTSFIELD — The world of musical theater lost Betty Comden in 2006 and Adolph Green in 2002. But the fruits of their collaboration live on, each production serving as a kind of posthumous tribute to the enduring appeal of their brand of wised-up wit. Comden and Green’s “On the Town,’’ with music by Leonard Bernstein, and “On the Twentieth Century,’’ with music by Cy Coleman, are running simultaneously on Broadway (and both productions are superior to the show that beat them last month for the Tony Award as best musical revival, Rodgers and Hammerstein’s “The King and I’’). Now Berkshire Theatre Group is presenting the undeniably dated but nonetheless charming “Bells Are Ringing,” directed by Ethan Heard and starring a never-better Kate Baldwin and her husband, Graham Rowat. For this 1956 musical, Comden and Green (book and lyrics) teamed up with composer Jule Styne, who later would create the score for “Gypsy’’ with a young lyricist named Stephen Sondheim. After a somewhat sluggish start, the BTG production uncorks and sustains a fizzy energy. Heard’s affection for this material is palpable, and he draws deft performances from his cast. Baldwin shone last summer in BTG’s Heard-directed “A Little Night Music’’ (and last month in “Simply Sondheim,’’ with the Boston Pops Esplanade Orchestra), but it is in “Bells Are Ringing,’’ showcased in a lead role, that this skilled actress-singer gets to fully demonstrate her versatility. She plays Ella Peterson, an employee at a New York telephone-answering service who suits her personality to fit each client. She can’t help getting involved in their lives, and ends up connecting several of them in a roundabout way. One of those to whom Ella extends solicitude is Jeffrey Moss, a stalled playwright, well played by Rowat. Having never met Ella, Jeffrey is under the impression that she is an elderly woman; he calls her “Mom.’’ He’s struggling to finish his first play since the departure of his writing partner. Under an assumed identity, Ella arranges an in-person meeting with the beleaguered playwright and proceeds to act as a kind of muse to him. When Sue succumbs to the charms of a scheming bookmaker (played by Joseph Dellger), the service does indeed become a front for a criminal operation, unbeknownst to Sue and Ella. The plot consequently thickens, but not all that much. “Bells Are Ringing’’ is more than happy to skim the surface, and it’s a mostly enjoyable ride. As the haughty guests drop name after name — Irving Lazar, Irwin Shaw, Evelyn Waugh, “Mary and Ethel’’ (Mary Martin and Ethel Merman) — Ella tries to keep up, while making a couple of cheeky attempts to subvert their pretensions. That scene segues into Baldwin’s performance of “The Party’s Over,’’ probably this musical’s best-known song. Baldwin nails it with a just-right air of wistful resignation, but that’s not the last word in “Bells Are Ringing.’’ In a show this high-spirited, another bell is bound to ring sooner or later. Book and lyrics by Betty Comden and Adolph Green. David Murin. Lights, Oliver Wason. Sound, Steve Brush.